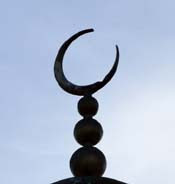 Muslims are now the third-largest religious group in the State behind Catholic and members of the Church of Ireland, according to Census figures released by the Central Statistics Office yesterday. There number of people who said their religion was Islam was 32,500 in April 2006, when the Census was conducted across the State. The number represents a 70 per cent increase since 2002. The figures also show that after Catholicism, the biggest recorded group is those who state they have no religion. Some 186,318 people said they had no religion, an increase of 35 per cent on the 2002 Census. There are now 3,681,446 people who state their religion as Catholic, a 6.3 per cent increase on 2002. A total of 125,585 said they were Church of Ireland, 32,539 Muslim, 29,206 were members of other Christian religions, 23,546 were Presbyterian, 20,798 were Orthodox, 12,160 Methodist, and 57,928 members of "other stated religions". Over 90 per cent of the Irish, Polish and Maltese nationals in the State on Census night were Catholics, illustrating a link between certain nationalities and religions. Other largely Catholic nationalities were Filipinos (84.4 per cent), Lithuanians (82.4 per cent) and Italians (79.1 per cent). Among Pakistani nationals living the State, 97.3 per cent were Muslims, while Greek and Cypriot nationals were predominately Orthodox (70.1 and 66.7 per cent respectively). Three-quarters of Chinese nationals and 58.2 per cent of Czechs had no religion.